RUCKERSVILLE, Virginia – As a kid, I loved playing with toy cars. Whether it was Hot Wheels, Tonka trucks, the Batmobile, or a G.I. Joe Jeep, two or more of them eventually met in a collision of sorts. That's probably why I enjoyed bumper cars so much. Smashing toys or bumper cars together was fun, but harmless. No one got hurt and no repairs had to be made. In the real world, a car crash can be devastating financially, mentally, or physically. Currently, there's no foolproof way of preventing accidents, with Transport Canada's latest public report in 2016 showing 115,956 personal injuries and 1,717 fatalities caused by motor vehicle collisions. 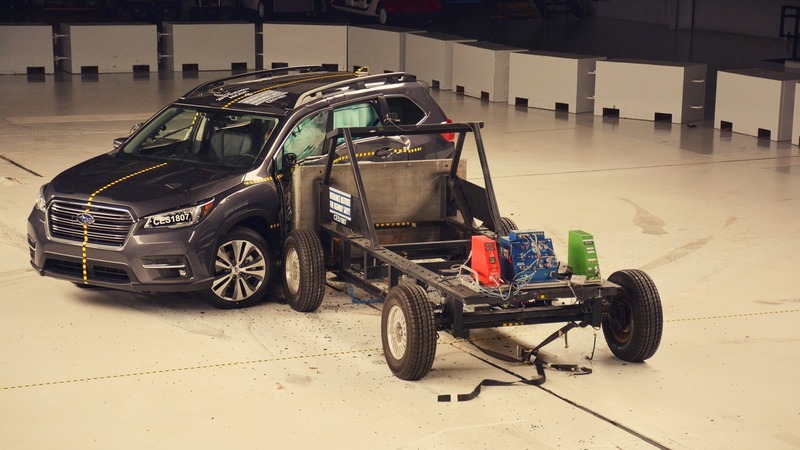 A safe place where crashes are held with anticipation and wonderment are at the U.S. Insurance Institute for Highway Safety's (IIHS) Vehicle Research Center in Ruckersville, Virginia. The IIHS is an independent, non-profit scientific and educational organization that performs its own tests—seven in total, and it's all paid for via auto insurers and insurance associations. As a third party, the IIHS bring in all the vehicles with a goal of letting the public know which vehicles are the safest after performing those tests and compiling the results through a ratings scale of Good, Acceptable, Marginal and Poor. Accumulate a lot of “Goods” and a Top Safety Pick (TSP), or even better, a Top Safety Pick+ (TSP+) will be awarded. Subaru Canada has brought us here to witness a side impact crash test of its 2019 Ascent, its new three-row SUV that it hopes to receive a TSP+, the highest honour the organization bestows on a vehicle. Given Subaru's IIHS track record of five TSP+ awards and another TSP for 2018, it would be surprising if the Ascent didn't achieve that top status. The Japanese brand's confidence is built off of its Modular Subaru Global platform that underpins all of its products until 2025. The Ascent's three-row configuration makes full use of the platform's flexible and adaptable design with increased safety measures including high-tensile-strength materials and an improved chassis shape. Due to the Ascent's size and three rows, more measures have been added including: triple the amount of structural adhesives, a larger cross-section framework to suit its increased weight, specifically-designed front and rear top suspension mounting points, and a new rear floor designed for three rows. The side impact test is one of the most dangerous, considering the limited amount of occupant protection. There isn't much of a crumple zone as in frontal overlap tests, merely inches, but the Subaru folks appeared self-assured. The IIHS conducted a few final preparations (it takes days for the whole set-up), but we were ready to see what a 1500-kg sled at 50 km/h would do to the Ascent. It would be smacking right in the middle of its first and second row with a raised front barrier end to represent the height of an SUV. The countdown started and there went the sled blasting into the Ascent without much drama. It was quick and loud like many real-world car crashes; however, a touch anticlimactic—a credit to the Ascent and Subaru. The Ascent got pushed for close to three metres, not much debris flew and the front and back end of the SUV stayed intact. I did peek at some internal video of inside the cockpit and saw the second-row dummy on the left side have its head snap hard to the right, a bit away from the seat, but that's expected, and it really should have been more violent. Before the test, Subaru talked about an uncommon composite design featuring different grades that created a type of crumple zone for its side, and that sure seemed to come into play on this crash. The composite is made out of high-tensile steel at the top and a softer material on the bottom that deflects forces to the ground and away from the occupants. On top of that, its structural integrity is kept together through a combination of steels including a hot press in its B-pillar. We won't know the IIHS results for two-to-four weeks, but Subaru's safety-first philosophy is a testament to the brand while simultaneously bettering its design, performance and value proposition. To receive a TSP+, one must have a fair share of safety prevention technology and the Ascent has it in spades being the first Subaru product to have its EyeSight suite of driver assists come standard on all trims. 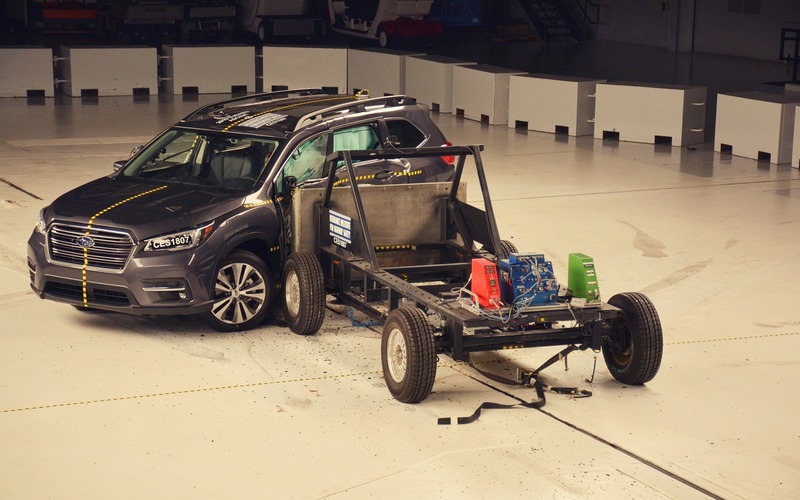 Safety as a marketing tool can be perceived as boring, but after witnessing the side impact crash and touring the IIHS Vehicle Research Center, it's clear that this is the real world and not a closed-course bumper cars game. The protection of human life is far too important to be content with a Marginal or even Acceptable rating. Winning IIHS TPS+ awards take time and extensive research, and that's a big part of the Subaru philosophy. The awards are nice to showcase, but they achieve far more than praise and a collection of dust, and that's meaningful enough to resonate with families looking for a new three-row vehicle.